At Seadragon.com you can share any image on the web as a zoomable photo. Simply point Seadragon.com at any image you’ve got on the web, and in no time flat, you’ve got a zoomable viewer just like this one. Share the link on Facebook, Twitter, or through email or IM. 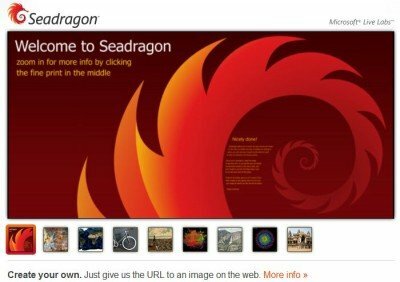 Seadragon.com allows you to share virtually any size image on the web, whether it is a five, ten or two hundred megapixels. Because the viewer uses the same Deep Zoom image technology available to developers in Microsoft Silverlight, no matter what size the image is it loads quickly. The embedded viewer adjusts dynamically to the layout of your page, or can be customized to a specific size with just a quick change to a script size, so now any size image fits perfectly on your site. Try creating one yourself. Source : LiveLabs.